November 05, 2018 at 11:04 pm. 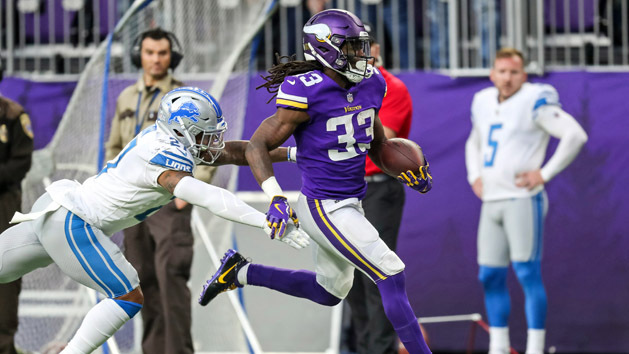 EAGAN, Minn. — Minnesota Vikings running Dalvin Cook shot through the opening in the offensive line created by center Pat Eflein, left guard Danny Isidora with right guard Mike Remmers getting to the second level to spring Cook loose. Cook exploded for the longest run of his short career, 70 yards, in Sunday’s 24-9 win against the Lions. In one sudden moment, Cook’s injury situation became secondary to his big-play potential. The second-year back was recorded as the fastest ball carrier in the NFL this season, according to NFL Next Gen Stats, reaching 22.07 miles per hour. Cook was laughing but said he knew he could do so when asked in a follow-up question. Cook could be an important piece for Minnesota as it looks to the second half of its season. The Vikings (5-3-1) enter their bye week having won four of their past five games. An extra week of rest can help Cook, who had missed four of five games with a hamstring injury. “I do think him being able to go through there and come in today feeling great, I think that is all good for going forward,” coach Mike Zimmer said Monday. Quarterback Kirk Cousins’ arrival in Minnesota has transformed the offense, with the Vikings eighth in the league in passing. Cook could alter the look of a run game that has finally gotten going with backup Latavius Murray after a slow start to the season. Minnesota has run for 91.7 yards per game this season, 29th in the NFL. Cook returned from the knee injury that cut his rookie season short after four games. Then he suffered the hamstring injury after just two games this year. Cook felt well enough on Sunday that the team scrapped its plans to limit his snaps. His teammates were happy to see a healthy, and fast, Cook. “I’ve joked he is the white tiger,” Cousins said. “When you go to the zoo and you want to see a white tiger, and they say he is not coming out today. You are disappointed and you’re like, ‘That’s why I bought the ticket, to see the white tiger.’ That’s Dalvin. He demonstrated special ability on one 70-yard run. He finished the game with 10 runs for 89 yards and four receptions for 20 yards. Sunday started an important stretch with three NFC North games in four weeks. Another upcoming factor for Minnesota will be playing away from home, outside as the weather gets colder. Three of the next four games are outside. After the bye, the Vikings play at Chicago, a game that was flexed on Monday from an afternoon start to the Sunday night game. “We just have to continue to be effective running the football,” Zimmer said. “I do think with some of these games as it starts to get colder, it is going to be more of a factor. I think we are getting better at a lot of the areas in the running game. We have to continue searching for more ways to pound the ball. 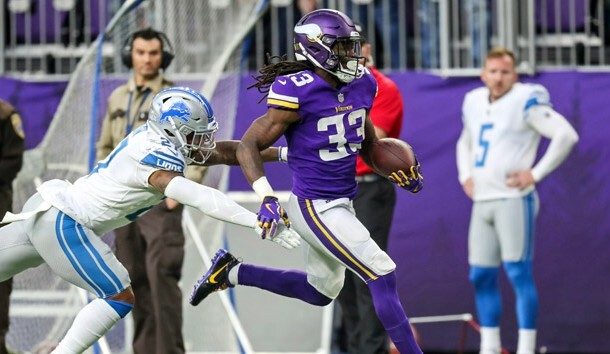 –RB Dalvin Cook showed he was healthy with a career-high, 70-yard run in Sunday’s game. He was tracked at 22.07 miles per hour on the run, the fastest of any ball carrier this season according to NFL Next Gen Stats. Cook ended up with 10 carries for 89 yards. –DE Danielle Hunter had a career-high 3.5 sacks on Sunday as Minnesota set a new team record with 10 sacks against the Lions. Hunter has only had one game this season he’s been held without a sack and he leads the league with 11.5 sacks. –WR Adam Thielen was held to four catches for 22 yards on Sunday, snapping his streak of eight straight games with at least 100 yards receiving. Thielen’s streak is the longest in NFL history to start a season and tied with Detroit’s Calvin Johnson for the longest streak in league history at any point in a season. Thielen did catch a touchdown pass, his sixth straight game with a touchdown reception. –RB Latavius Murray had a touchdown run in Sunday’s game, his fifth touchdown run of the season. Murray now has a touchdown in four straight games. It was his 25th rushing touchdown since the start of the 2016 season. Only Todd Gurley (30) and Ezekiel Elliott (25) have as many in that span. –CB Xavier Rhodes ended up playing 42 defensive snaps on Sunday, 60 percent of Minnesota’s defensive total. Rhodes played through a foot injury that had caused him to miss the Week 8 game. Coach Mike Zimmer said Rhodes should be fine after the team’s bye week.